Many different cultures tell tales of the end of days. For some, it’s a moment of terror. For others, it’s a moment to rejoice. In Norse mythology, that apocalyptic event was known as Ragnarok. It was heralded by the deaths of important nobles and gods, terrible natural disasters, and finally a great battle. At the end of it all, the world was submerged by the sea, only to rise again and start anew. In 2015, the world was introduced to Eric M. Lang’s vision of the final battle of Ragnarok, Blood Rage. The epic title featured warring clans fighting for victory, or the chance to die a glorious death and be welcomed into Valhalla! The clans could recruit legendary monsters pulled right from the pages of Norse tales, like the Frost Giant, Valkyrie, Sea Serpent, and Troll. With these fearsome beasts on their side, a clan would become a terrifying opponent. Coming to Kickstarter on December 3, at 12PM EST, Blood Rage Digital captures all of the excitement of the analog board game in a digital format. Players will be able to play against one another or take on an AI that can be scaled for difficulty. Both players new to the game and war-weary combat veterans will find a challenge that suits their skill level. Featuring an intuitive interface and amazingly-detailed graphics, Blood Rage Digital will please any Viking fan out there. For those players that like to hold a physical piece in their hands as they play, the Blood Rage Digital Kickstarter will also be offering a pledge level that includes some all new, highly-detailed miniature figures. There are four alternate sculpts to some of the monsters that were a part of the original Kickstarter campaign for Blood Rage. Like Fenrir, Garm is a giant wolf-like creature that was often depicted as the guard to the gates of Hel. His bone-chilling howl was said to herald the beginning of Ragnarok. Legends of lycanthropes were common in Eastern Europe, but the tales made their way into Norse mythologies as well. The Wolfwoman transforms into a killer beast, deadly on the battlefield, but useful at your side. Giants and Trolls are a huge part of the Norse mythologies, and deep in the mountains of Scandinavia was where these monsters were said to have lived. The Mountain Giantess and the Seer Troll will make any clan stronger, and scarier, to encounter. Blood Rage Digital also offers a complete new clan of miniatures for your physical game. The Stag was an important symbol in Norse mythology featured in many of their tales and poems. The Stag Clan takes to the war with a fearless abandon. Featuring two different Warrior sculpts, a Leader, and a Mystic, the Stag Clan fears nothing. This new clan also includes all the cards necessary to expand the game to five players. They are the perfect match for a player that is looking for blood-drenched victory or a ticket to Valhalla. Blood Rage Digital features all of the tension and excitement of the board game rendered in beautiful graphics and delivered with an easy to use interface. Include the alternate sculpt Monsters and a new clan for the board game, and you have a package that no fan of the game can resist. The signs are clear. Ragnarok is coming. Join the fight for glory, or be swallowed by the sea. 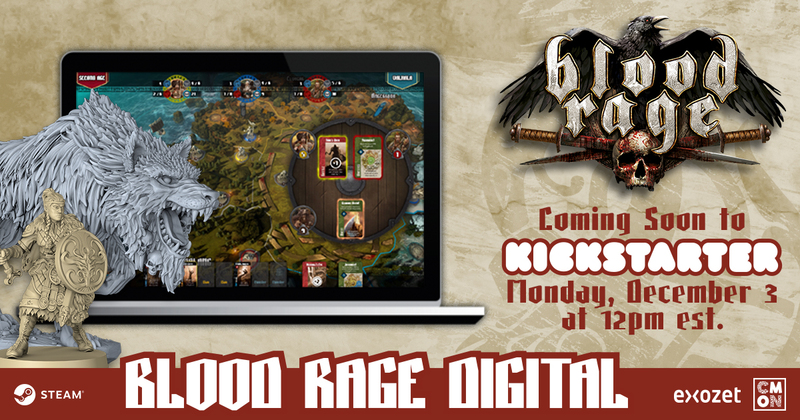 Blood Rage Digital will launch on Kickstarter on December 3 at 12 PM EST.